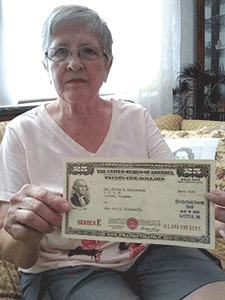 Mary Runnels holds a 1956 Series E war bond that she recently found. Her mother, Floris Blankenship, purchased the bond for her for $18.75. It is now worth $188.59, Runnels said, noting it stopped accruing interest after 30 years. Her mother bought the bond for her as a life lesson about saving, Runnels said.